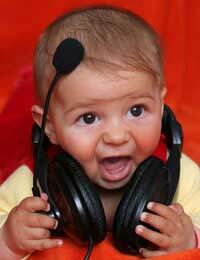 Hearing tests for the newborn are a fairly recent development in the screening services offered to new babies. They were introduced as a way of detecting any possible hearing deficits at the earliest opportunity allowing for adequate provision and future assessment for the young. A hearing test for newborns is a way of assessing whether the baby is at risk of having a hearing deficit which can be treated or overcome as soon as possible allowing the baby the best start in life.Any problems detected can be treated appropriately providing the tools that baby needs to develop to its potential. Often the test will be carried out in the hospital where the baby was born, shortly before discharge. If the baby was born at home the test may be carried out in the home or at a clinic which can provide the necessary equipment.The person who performs the test will be highly trained in not just the equipment and the testing procedure, but the handling of the child also.The test is painless and often the baby will continue to sleep during the procedure.A small device is placed in the baby’s ear and linked to a detection machine which contains sensors. Sounds are transmitted through the earpiece and the sensors pick up any echo that is reverberated back, these are sent to the machine and displayed as a graphic. The echoes are caused by the sounds reaching the cochlea in the inner ear.Both ears will be tested and a result produced for each side. The results of the test are available as soon as the test has been completed. The person performing the test will be able to interpret the information provided by the testing equipment and assess whether a further test is needed if the results show a deficit in hearing ability. What Happens If My Baby Fails The Test? If a baby’s result shows a deficit in hearing, this is not classed as a failure as there is no right or wrong result as the test is merely an indication of hearing ability and a deficit does not mean your baby is a failure by any means.It simply means that the test may have to be performed again at a later date in order to re-assess any problem with the hearing.During pregnancy the baby is surrounded by fluid which can enter the ears and temporarily block them at birth. Couple this with the mucous and secretions that it may face during the birthing process and the chances are your baby’s ears will be filled with these products that may take some time to clear. Many newborns show a result that indicates that full hearing ability is not present, most of them for this very reason and a re-test will be necessary a few weeks after the birth allowing time for the ears to drain or absorb the fluid that they contain. Hearing tests are painless procedures that allows any hearing problems to be picked up at an early age allowing for provisions to be made in the event of any marked deafness.